My good friend Pat made these for a holiday cookie exchange years ago. When I was digging through my recipe drawer the other day, I found it again. Oh, the memories. I remember these being so unusual, and yet so very delicious. And that’s when I decided to make them for Christmas. Right then and there. Butter set out to soften…check. Look to see if I had oats, coconut and pecans in the pantry…check. Orange slice candies anywhere? Of course not. I don’t keep these things around my house. Sure I loved them as a kid, but I can’t remember the last time I bought a bag. Good thing there’s a new Kroger around the corner from my house, huh? And by the time I get back, my butter will be soft! Timing is everything. These cookies are super easy to make and really, really delicious. You should make them. Like today. Here’s the recipe, thanks to Miss Pat. Pre-heat your oven to 350F. In a large bowl, beat softened butter, brown sugar and granulated sugar until well blended. Add the eggs and vanilla and beat until combined. In a separate bowl, mix together 2 cups flour, salt and baking soda; add to butter mixture and beat to combine. Cut up orange slice candies (I cut each slice into 5 pieces) and toss them with one tablespoon of flour to keep them from sticking together. To the cookie batter mixture, add the orange slice candy pieces, chopped pecans, oats and coconut. Mix until everything is combined. The dough will be really thick. I like to use a heavy wooden spoon or my hands to mix it. I also like to use a cookie scoop so these turn out uniform in size. If you don’t have one, use a spoon to scoop up about 2 Tablespoons of dough; roll it into a ball, and place dough balls about 2″ apart on a cookie sheet. Bake at 350F for 12-20 minutes (see note below). When the cookies start to turn a little brown around the edges, they’re done. Cool on cookie sheets for at least 10 minutes before removing them from the pan to cool. Makes 4-6 dozen, depending on how large or small you make them. NOTE: This recipe is similar to an oatmeal or chocolate chip cookie dough, so baking time is a matter of personal preference. If you like them chewy like I do, bake them 12-15 minutes. If you like them crispy, bake them 15-20 minutes. 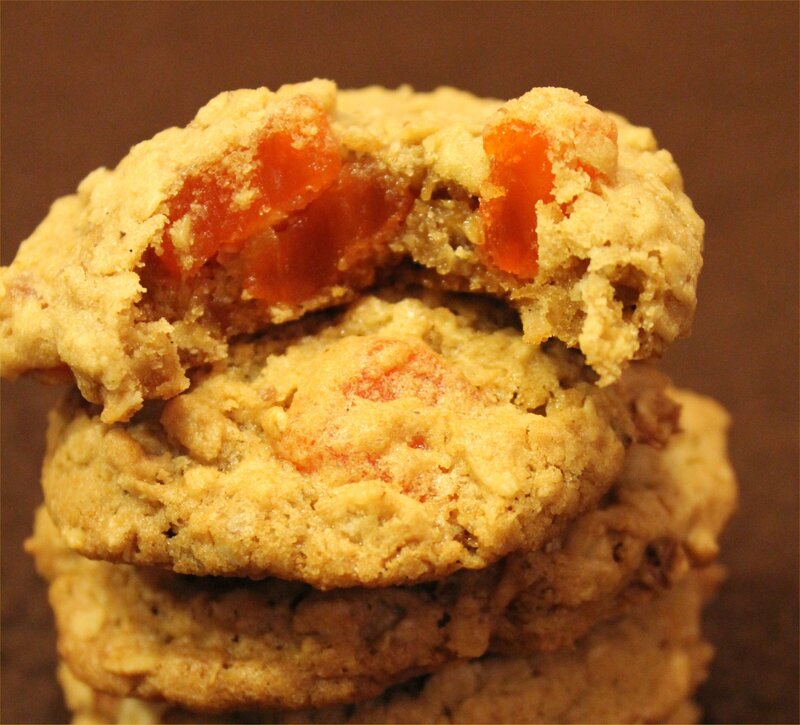 If you want to get really fancy, you can top each cookie with a thin slice of the orange slice candies. Most importantly, get a glass of cold milk ready. Yeah, she’s pretty awesome. Funny, too. Thanks for sharing the recipe. Hope you have a great weekend with your sister! My Grandmother used to make these for me when she was alive. This recipe is also awesome with chocolate chips or raisins instead of the orange slices.